We had such a lovely, sunny weather over the past few days, definitely preparing us all for the upcoming spring and summertime. That's why I decided to share with you a few of the upcoming spring&summer trends to incorporate into our everyday style. Even though bomber jackets have been around for a while now, they will still be a big if not even the biggest trend of the upcoming seasons. Both high-street and designer shops now offer you a wide range of options to choose from - navy, black or khaki. But if you want to be fully on trend opt for a print (graphic) bomber jacket. Pastel pink will also make a comeback, especially on bomber jackets or long skirts with paper bag waist - another trend which was seen everywhere on the FW runways. 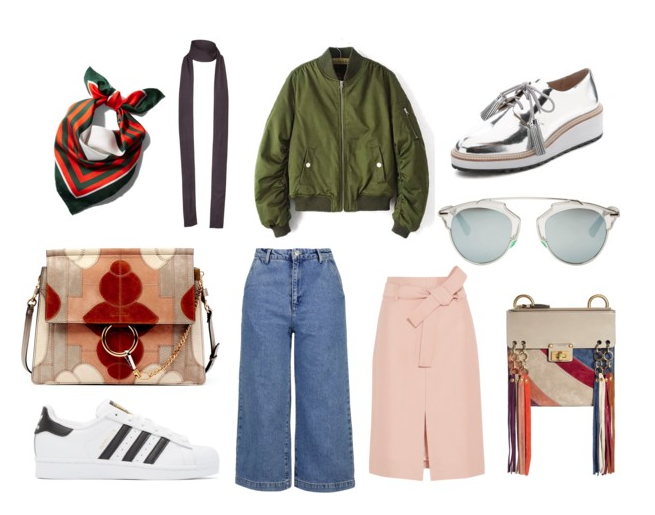 The trend of the 70s will continue into the warmer seasons especially with culottes or flared jeans in general. This is quite a tricky trend to wear depending on your body type. For me personally, it looks best when you wear flared jeans with high-heels or square heel boots to elongate your legs and make you appear much taller. But if you are quite tall already, then you can definitely get away with pairing the jeans with simple sneakers (especially Adidas) or this season's newest trend - silver shoes. Now for the accessories: mirrored sunglasses (with a variety of colours to choose from) will still continue into the spring/summertime. They are an easy way to give your outfit another focus point and also a pop of colour. Another great option are neck scarves, if you would like a chic addition to your outfit. Graphic bags (especially those involving fringe) were seen everywhere on the FW Street Style, because they are a nice, elevated version of the popular 70s inspired bags that have dominated previous seasons. But the biggest trend out of them all that everyone has been obsessing over, is Patchwork - from jeans, skirts, jackets, bags, etc. Everything will be very graphic and full of prints. What is your favourite Spring/Summer trend? Let me know in the comments below.